Imagine you are about to start a business conference and suddenly there is a requirement to play a video which is stored in your PC; or you need to reference a file which you had saved two weeks earlier and is stored in your laptop. Hassle and time waste are the only terms which strikes me as I recall attempting these actions in the middle of a conference. However, with Splendo, such inter-sharing of data between a TV display and PC/Laptop can become seamless, easy and comfortable. All for Rs 8999 or $140 only. iBall, in association with Microsoft has launched their first PC-On-A-Stick device which can instantly convert any TV into a PC. All you need to do is insert this device into the HDMI port of the TV – you can have a seamless experience of multimedia, Internet and TV functionalities at the same place. Named as Splendo, this device can be plugged into any TV – be it at your home, office or hotel. Powered with Atom Quad Core processor from Intel and 2 GB RAM with 32 GB internal memory, Splendo runs on the latest Windows 8.1 OS. Splendo is created using a fanless design and is covered under one year warranty. Creators of Splendo want it to replace laptops for those, who are always on the move. Being a small and handy device, it can fit into a pocket, and can be effectively used wherever there is a TV available. Having an unmatched Windows experience on a TV, anywhere you wish, is certainly one of the powerful USPs of this device. 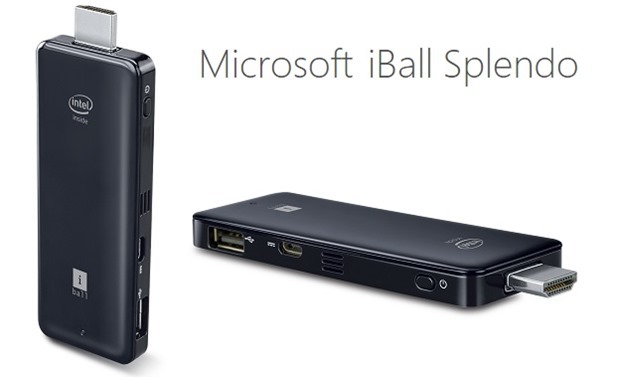 iBall Splendo will be available for sale beginning of July across the country. It will also be broadly available on IT and TV retail channels. This April, Google in association with Asus had launched a similar device: Chromebit; which can convert any TV into a PC. Infact, with Chromebit, users can convert any display device into a working PC. It seems Splendo is an attempt by Microsoft to counter Google in this niche. Comparably, Chromebit is priced cheaper (Rs 6000), and is powered by a Rockchip quad core processor. PC-On-A-Stick devices are now slowly but gradually becoming popular; and with the entry of Google and Microsoft, this niche will surely attract more vendors in the coming days. "Microsoft-iBall Launch Their First PC-On-A-Stick Device To Convert Any TV Into A PC For Rs 8999", 5 out of 5 based on 1 ratings.